Hikers on the East Rim Trail get the Echo Canyon section of the hike and peer over the rock's edge wondering what is down in that dark, skinny slot. This slot canyon exploration will answer that question. This hike is only done in the summer season and often only in dry years when the water that runs through Echo Canyon dries up so parts of the canyon can be explored by hikers. Be aware there are pockets of water that may stagnate. The more water that is present the harder exploration will be. Do not go into any section of this canyon that must be swam or climbed. (Remember you would have to climb up what you climb down to get out!) Going past any section that requires simple hiking skills is not allowed without a permit. The water deep in this canyon is ice cold and wetsuits, ropes and other equipment are required. Distance: To explore Echo Canyon when dry: 2 miles one way to the slot, then about 2 miles through the slot and back out to the Observation Point Trail. 8 miles round trip. Difficulty: Hikers should only explore the canyon as far as is comfortable. The conditions in Echo Canyon change rapidly and constantly. Often there is standing water the entire summer, limiting exploration by hikers. Do not enter the technical sections without a ZNP permit or the proper gear and knowledge. Echo Canyon is a technical slot canyon that often has cold water sections that must be swam. The water is cold enough that canyoneers shiver in a 3mm suit in the summer. There are difficult down climbs and a keeper pot hole might be present depending on the current conditions of the canyon. The trail up to Echo Canyon is an uphill strenuous hike on a paved and populated trail. Obtain current canyon conditions at the Zion backcountry desk before attempting any slot canyon hike. Permits: Required if doing Echo Canyon as a technical canyon. 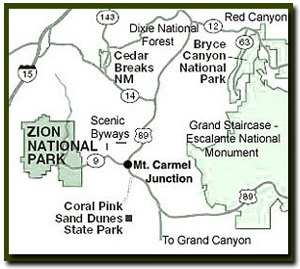 Trail Access: From mid-March to late October, park at the Zion Canyon Visitors Center, the Zion Human History Museum or Canyon Junction and ride the Zion Canyon Shuttle. Get off at the next to the last shuttle stop. From November until late March drive into the canyon and park at the Weeping Rock parking lot. Off the Beaten Path: Observation Point is a heavily used trail, but once dropping into Echo Canyon there are few hikers. During long periods of drought a short section of Echo Canyon can be dry enough it can be explored without technical canyoneering gear. The Trail to Echo Canyon - Begin at the Weeping Rock parking lot about midway in Zion Canyon. Hike 2 miles up the Observation Point Trail to where the trail crosses a wash. There is often water present especially in the winter and spring. This is where the slot canyon is entered. Bypass this area for a moment and continue up the Observation Point Trail so that you can look down into the slot canyon. Backtrack to the wash and make your way into the slot canyon entrance. In the winter and spring the water in the slot canyon is ice cold. Bring a rope for emergencies. As with all slot canyons there is a danger of flash flooding. Check the Zion Visitors Center for the weather report. Echo Canyon - The slot canyon is impressive with many high wall sections and erie lighting. Do not enter any pools water or do any climbing in the slot without a permit. The conditions in this slot canyon change. After the initial section the path leads to an opening and a choice of direction. Take the slot to the left. Trail Options - This section of Echo Canyon can be accessed as part of an East Rim Trail hike or Observation Point hike. 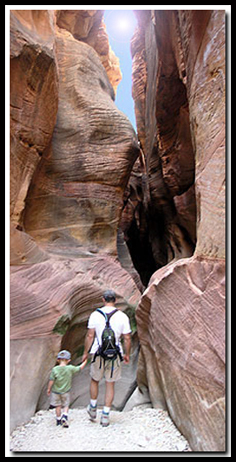 Best Trail Features - This is a magnificent slot canyon right in the heart of Zion Canyon that most hikers can explore when the canyon is dry.